Excellent meeting this morning at the office of the Surrey Police Crime Commissioner, and very promising opportunities for close partnership working. Meeting shortly too with company behind the highly successful “Wearesurge” website. 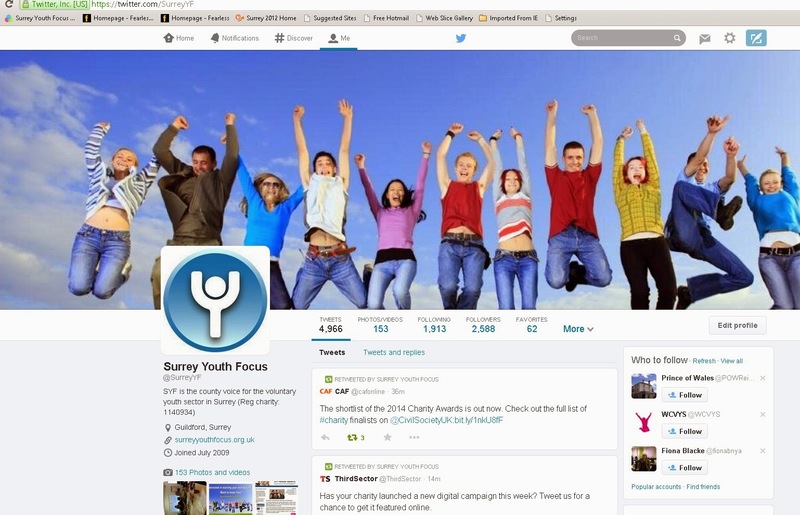 Our own revamped website is progressing well with a view to launch in early June, so that we can promote Surrey CC ‘s Youth Small grants programme as and when our role is finally agreed in a contract. Talking of contracts we are up to Canary Wharf next week to meet with the CSR people from a national bank that have agreed to sponsor COMMUNILAB (and Surrey Police Commissioner ‘s office will also join). We have finished the Draft Annual Report and Accounts and met with our external examiner – auditor- on Thursday who gave very useful advice about a number of strategic issues. Otherwise, this short week has been taken up with interviews and appointments – more later. Also finished the bid for training youth workers about mental health issues, just in time for a network meeting with Surrey and Borders NHS Trust next week. Interesting too that Surrey Young Carers have an excellent draft report out- “Surrey Young Carers Health Survey Report 2012” in which, no surprise, the principal wellbeing issues relates to mental health. So we are all on the same page. Looks like a sunny weekend and we have our oldest friends coming down from Scotland – my friend from school (50 years ago) and his wife, who, before we were married, flat shared with my wife on trendy Portobello Rd in the early 1970s and who met at our engagement party. Long term partnerships in all senses! Work has been a curate’s egg this week – the not so good has been drafting the Annual Report/Accounts for 2012/13 which we’re trying to get done earlier so that it goes to Trustees on 23 July and AGM on 17 September, and, though boring, it is done! Next step is to write the Impact Report – the pop one page summary, which our volunteer business adviser, Shelagh West will do as she is brilliant at promotion. I am hearing the results of Surrey CC’s Local Prevention Framework grant award decisions as the “mini –competitions” (Dragon’s Den) take place. No surprises thus far, but I think some missed opportunities. It remains my view that the procurement process has again been flawed, with “keep card close to chest” competition through BRAVO, and yet a hope for collaboration and innovation with more smaller youth organisations being awarded contracts resulting in an entirely “schizophrenic” process. The rest was good. We are currently (Thursday and Friday ) interviewing for two part time posts: a new Events and marketing person, and a Youth Work adviser being a re-framing of a vacant youth development worker post. “Encouraging” is all I can say at present – results next week. Met with colleagues from the Cabinet Office and The Challenge Network (members of ours) on Monday. The National Citizenship Scheme is an important priority for the Cabinet Office and in Surrey The Challenge Network have already signed up 815 young people to go on their summer programme against their contractual target of 900. They are pitching to schools and getting a good response, though need projects for young volunteers to do – we will be assisting them. Well I never got to see The Doors in the 1960s – I don’t think they came to London when I was a student, though they did go to Paris. Obviously as a good student I have got several Doors CDs, and know all the lyrics….if you’re not keeping up, Ray Manzarek the very distinctive organist died this week…..We have the Hanover Band -very professional small orchestra of 17 players - performing Baroque music (Bach, Handel etc) on original instruments in our parish church this evening. Friends round for wine and supper (in that order) on Sunday evening….we just need the weather. It was 4C in the car this morning ..ice warning- on 24 May?? Light my fire! Bend it like Beckham is always my advice to organisations considering any form of grant bid - in other words to “bend” their service offer to meet the requirements of the grant giving body (getting the ball over the wall) , but beware shooting over the top or wide-mission drift! So the footballing celebrity retires from football..but is still a celebrity..and funding model! Strange week. Our sister organisation West Sussex Council for Voluntary Services with whom we have a Memorandum of Understanding have formally announced they are closing, subject to approval by their members at their AGM on 19 June. We are likely to be holding discussions with WCVYS but nothing can be assumed or taken for granted – Trustees and members will have strong views all round, as do I of course! Our inner cabinet – Management and Finance commented on our business plan this week , and then signed it off, but there are sensitivities all round..an awareness that this is a key “time of change” year, and colleagues are being cautious. That’s difficult for me as I see strategic opportunities very clearly and expect others to do so too, but those with different thinking and personality styles want to see details and persuasive facts. It really is time I learnt this! Part of the big picture came together yesterday when we agreed with Surrey Chamber of Commerce to go into partnership appreciating that we are near identical support service organisations – one for businesses the other for voluntary youth organisations. The fruits of this will be in our being able to offer opportunities to businesses to mentor young people, undertake volunteering projects, introductory discounted membership of the Chamber fro our members and so on. My thanks to our volunteer Shelagh West for promoting these ideas. The Surrey CC Local Prevention Framework grant bid date expired last week and “mini – competitions” (presentations by selected bidders to local councillors, young people et al) have been taking place. Suffice to say, I am hearing mixed reports about the process. The closing date for our two new posts is today and we’ll shortlist on Monday – interviews on Thursday and Friday and we have some good candidates for both posts (Youth Work adviser and Events and marketing). We need more staff in as we’re so busy ! New website being developed well now and should be ready first week of June for Beta testing. Off on (religious) retreat this afternoon to Walsingham for the weekend, being the village in north Norfolk which is a place of pilgrimage and a centre for Anglo-Catholicism, and Roman Catholicism - should at the least be peaceful and contemplative. Important to get priorities right this week! We were the second family in our road to get a new fangled TV in 1958, and I remember watching Newsreel of the Munich air crash, following which MU ‘s “Busby Babes” got into the FA Cup Final that year against all the odds, but losing to Bolton – header by Nat Lofthouse at the end was the undoing. I cried- I was 9! So Fergie’s retirement this week is an important event for some of us! Obviously I have got the full fixture list for the Rugby World Cup in England in summer 2015, and the atmosphere is building already…. Well a quiet week following the Bank Holiday. Surrey Community Action had their annual conference on Tuesday morning – first day back, so it felt a bit odd. I fear too many speakers, ran late, and I think many of us wanted to hear more about the RAISE survey findings. Pity. Then had to rush to meeting at 2.00 pm at the social enterprise (also in Leatherhead), which is coming on- funds in bank, now need to sign off 3 year lease and get staff. Otherwise dominated by completing the Business Plan for 2013/14, and starting to write the Annual Report for 2012-13. Also finished a business case for the Consortium to bid to GMTs for funds for mental health training for youth workers that will be discussed at the Consortium Board next Friday. Bidders for Surrey CC’s Local Prevention Framework grants are waiting to hear if they are required at the next stage - 2 mini-competitions (ie dragons den type presentations) the first of which is Elmbridge next Tuesday, and then Epsom on Wed…….just in time?? Strategically important discussion with colleagues in Sussex this afternoon- more later, and also we have got financial backing and sponsorship from a major bank for our COMMUNILAB idea, so maybe not so quiet this week after all! The week’s themes have been about money and the amazing achievements of young people. On the money side, we met at County Hall to discuss our running of the Surrey CC Small Grants scheme which we are being commissioned to take over administratively. WE need to crank up the workflow so that it is as clear and efficient as possible, and are very aware that the process of awarding the small grants (typically in the range £500-£1,000,with £5,000 the max.) will be delayed this summer because of the Council Elections (yesterday) and the necessary processes of appointing new Committee Chairs, which will mean that in some case the Chairs won’t be in place until late July, and some voluntary organisations will be wanting to run projects in the summer. The delays will be unavoidable, and we will have to structure expectations accordingly. Today is also the closing date (at 3.00pm) for bids to SCC for the Local Prevention Framework, which has, frankly, not been a great process. I predict that nearly all bidders will get through the BRAVO process, there will then be the mini – competitions (dragons den style) which is the key process, and then I suspect it will prove impossible to decide between a good 100% bid against 4 good specialist bids, and so a horse-trade (“negotiation”) will result…….SO it is NOT (of course) a rational/scientific process, but….a horse trade of what best fits. Still on money..just heard that a major bank are funding our COMMUNILAB project! More next week! The Big Assist work is also progressing – being the consultant who is looking into ways of achieving cost savings/enhancing benefits/new network structures across the voluntary sector. Very exciting, if slightly challenging for those of us who initiate projects and find them reflected back..oops..loss of control..help! And I got the last tickets at Glive for Bellowhead (big fan) in November! Hurrah! Enjoy the lovely Bank Holiday week-end !